April is National Stress Awareness Month. And there’s good reason for dedicating an entire month to raising awareness about this issue – according to a recent survey of 2,843 professionals by LinkedIn, half (49%) of workers today report feeling stressed in their jobs. We at LinkedIn Learning want it to be lower. So, first, we’ll define the problem by analyzing the biggest drivers of stress at work and how it differs by age, seniority and gender. And then, we’ll provide best practices for reducing stress in your professional life, based on advice from our expert instructors. Let’s dive right in. 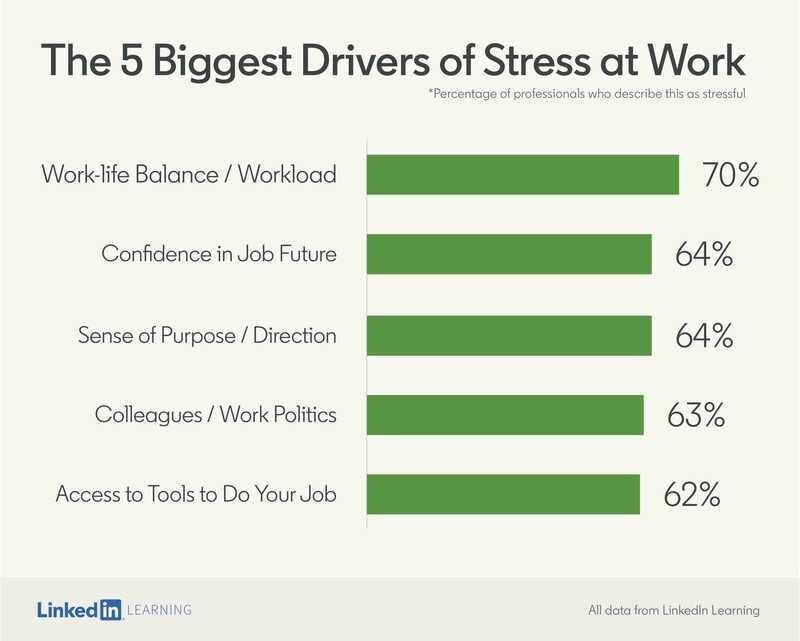 Let’s start with the biggest drivers of stress in the workplace. 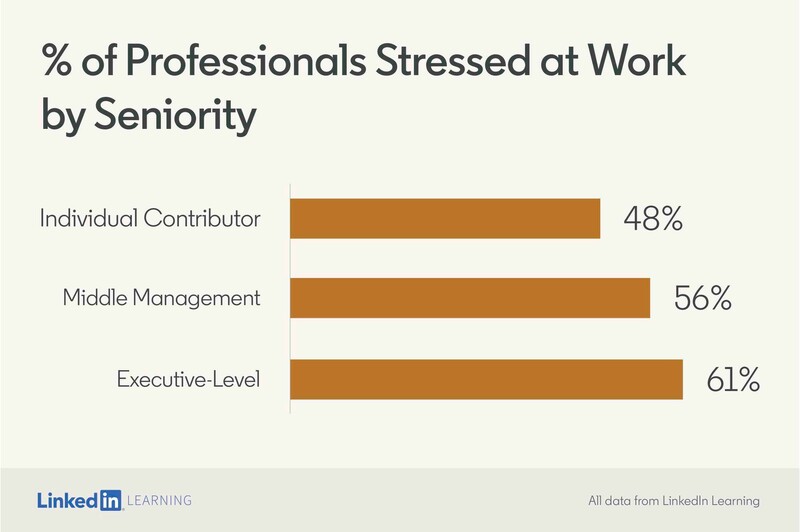 Across gender, age and seniority, workload is the biggest cause of stress among professionals. The second on the list – stress about the future – is noteworthy. In the Age of AI where things are changing faster than ever, professionals are increasingly feeling stress over the future of their jobs. How does stress shake out by age? 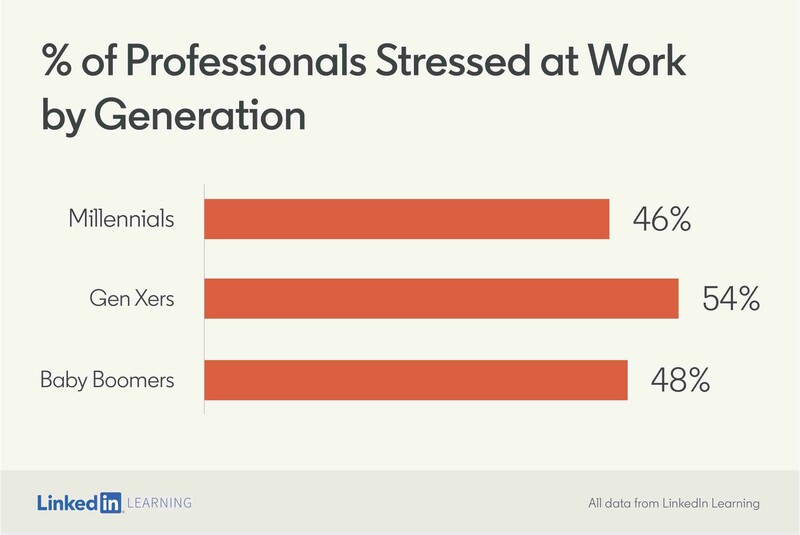 Well, of the three dominant generations in the workforce, Gen Xers are the most stressed. Why? Gen Xers are more stressed about confidence in their job future than other generations. This is could be stemming from AI and how it’s rapidly changing industries – LinkedIn data shows that Gen Xers are less likely to have AI skills than their millennial counterparts, and unlike Baby Boomers, they still are a good 20 years away from retirement. Millennials, meanwhile, tend to feel more stressed about their sense of purpose and their opportunities to learn and grow, compared to other generations. You’d think, the more you move up within an organization and the more status you gain, the less stress you'll feel. And yet the opposite is true. As people move up from individual contributors to middle management to executive level, LinkedIn data shows their stress level only increases. Middle managers report feeling the most stress at work from their workload. Individual contributors are more likely to feel stressed because they don’t have the tools to do their job and because they don’t feel a sense of belonging at work. Finally, Who Is More Stressed at Work – Men or Women? Lastly, who is feeling more stressed overall, men or women in the workplace? There’s no meaningful difference. Overall, 50% of men report being stressed at work, with 48% of women reporting so. Women and men tend to have the same drivers of stress at work as well, with the only meaningful difference that women tend to feel a bit more stress at work dealing with colleagues and office politics. Now that we’ve identified the key drivers of stress at work and who is feeling it the most, here’s the real question – how do you overcome these challenges? What are the key skills you need to learn to keep your stress level low? We’ll walk through the four biggest drivers of stress at work and provide playbooks for combating each one. 1. Start saying “No” more. The biggest cause of stress at work is workload and a lack of work-life balance. What’s the key to overcoming this? Saying “no” more, according to LinkedIn Learning Instructor and Time Management Guru Dave Crenshaw. By taking on less, you’ll be able to better execute your most important work, and you’ll feel less stress at work. This starts with setting realistic priorities – and then relentlessly adhering to them. 2. You can’t control the future. But you can control yourself. The second-biggest cause of stress in the workplace is a fear about the future of your job. In some ways, this is understandable – we are in the Age of AI. Things really are changing faster than ever. Sure, that change means uncertainty, which leads to stress. But it also means great opportunity. The best way to thrive in this fluid environment is investing in yourself by making learning a part of your daily routine, according to the World Economic Forum. Specifically, the WEF recommends mastering soft skills, and learning at least the basics of AI. Not only will this reduce your stress at work, it’ll make you more marketable as well. 3. Know that nobody has it all figured out. The key is to continue to reflect. Here’s a stressor at work that disproportionately affects younger professionals – finding your purpose. What’s the point of all of this? Am I really following my true “passion”? Here’s the reality – very few people have it all figured out. It’s okay if you don’t either. The best careers are built on a series of minor adjustments along the way. The key is to reflect – ask yourself what you like about your current job, what you don’t like and what appeals to you the most, according to LinkedIn Learning Instructors Elizabeth Lotardo and Lisa Earle McLeod. The more specific you can be, the more you’ll get to know yourself. And that’ll bring you closer and closer to your true purpose. 4. Politics at work is a reality, but it’s not as bad as it sounds. Finally, we come to a driver of stress around something few of us like – work politics. I know, it’s easy to say “I don’t play politics” and move on. But the truth is that every job and every organization has some level of politics to it. Which means, to excel in your role, you need to play politics – at least a little bit. The good news? Playing politics at work doesn’t have to be as distasteful as you’d think, according to LinkedIn Learning Instructor Dorie Clark. Instead, in her course on the topic, she explains that the best work politicians “make smart and strategic moves in order to gain influence authentically,” as opposed to working deceptively. Bottom line, stress at work is a problem that could only get worse as you advance your career, if left unaddressed. But, by learning a few key skills, you can keep stress at bay and live that best life. Methodology: This report was compiled from a global survey of 2,843 English-speaking professionals on LinkedIn.